Everyone knows that we've been using toxins or fungus or pollution or pesticides to wantonly murder whole hives full of bees for the last decade or so, but did you know that in the past they've been doing the same to us? (And occasionally the same for us.) 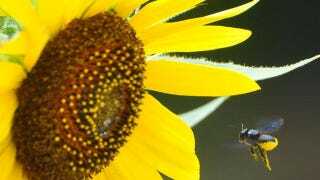 Bees have been engaged in a poisonous war with humans for thousands of years. Now that the bees are dying out for some mysterious reason, we're not only losing our crop pollination systems, we're also losing a valuable historic weapon. Siccing angry bees on someone has been a popular way to beat them back since the age of antiquity. And it kept working well into the war of 1812, when a twelve-year-old in Maryland convinced the British crew of a warship that a buzzing box was full of hummingbirds which they should only check on once they'd gotten them safe into the hold of the ship. But bees were also used far more subtly. We can tolerate poisons that kill them, and they can do the same for poisons that would kill us. People took advantage of that all the time. The people in Colchis, along the Black Sea, knocked out a invading army of thousands of soldiers by putting up beehives near rhododendron, azalea, and oleander bushes. Some say it made the soldiers blissful. Their general, Xenophon, said it made the entire army "despondent." Either way, they toppled over by the thousand and were unable to move for days. Perversely, the Greeks soon considered the "raving honey" medicinal, and would dose people who were already raving with it, hoping that it would reverse madness. Although they found a use for the mildly poisoned honey, they learned to avoid the honey that came after wet springs, which favored the poisonous bushes more than any others and made the honey deadly. Thousands of years later, Confederate soldiers raiding hives were sometimes downed by the same plants - many of which were imported. Around the world, people would, accidentally or deliberately, be poisoned by honey. Hemlock was said to have made honey so poisonous that people would collapse after a taste. Some say that the phrase "sardonic," was named after an affliction in Sardinia, in which people who had eaten either honey made from a certain plant, or the plant itself, would have mirthless paroxysms of laughter before dying. Every culture from New Zealand to Mexico knew of certain plants that would pass through bees without harm but kill humans - and made use of this knowledge. Eventually people learned how to game the system. Small doses of raving honey, also called "fresh honey" because it came in early spring, were used recreationally. When opium started growing, many used honey cultivated near opium fields to get high. Others noticed that chestnut honey had a hypnotic effect. The practice continued into the 1800s. In New Jersey, early bee keepers sold honey made from the flowers of the Mountain Laurel, supposedly as a tonic but actually to get people high. Honey poisonings have gone down as beekeeping turned professiona, but even now we're not entirely savvy. Amateur bee keepers still experience occasional accidental poisonings, especially in early spring in the southeastern United States, when rhododendrons are the only plants out, and in the southwest desert, where oleander thrives. We may be poisoning the bees, but they're capable of doing the same to us if we're not careful. Via Academia.edu and All About Flowers.